Immersed in the pastoral and verdant Mantuan countryside, Villa Negri is an enchanting and elegant sixteenth-century historical residence, originally belonging to Ferdinando di Gonzaga, Lord of Guastalla. 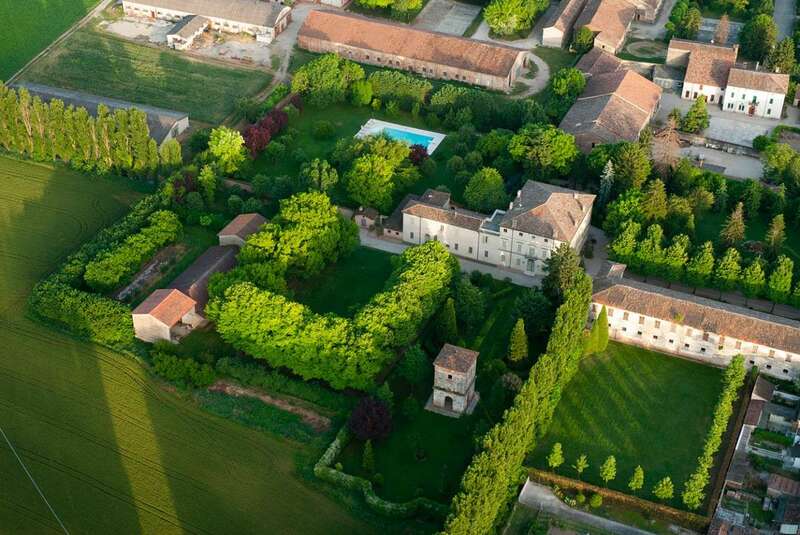 The Villa, located halfway between Mantua and Sabbioneta, preserves its ancient and prestigious charm intact thanks to its splendid rooms and the immense centuries-old park that surrounds it. Villa Negri is the perfect setting for an exclusive and memorable wedding, in a fairytale atmosphere where time seems to have crystallized itself. A long and romantic avenue of lime trees, mixed with the beautiful climbing roses that run along the vaults of the old stable leads to the manor house, where a patient and skillful restoration has brought back its rooms to its former splendor. From the charming Sala del Fornaretto, with its noble fireplace and the original sixteenth-century frescoes of Fornaretto Mantovano, to the Sala del Duca, through the sumptuous Central Hall, the Sala delle Finestre and the so-called "secret garden". All refined and exclusive environments, embellished with frescoes and fine antique furnishings, able to accommodate up to 200 guests who will undoubtedly be amazed by the magnificence of this historic residence that exudes charm and wonder from every corner. A charm that turns into dreamy magic when you go outside, in the sumptuous and well-kept secular park that is a real oasis of peace, colors and scents, embellished with a characteristic ancient tower, which can become the perfect setting for a suggestive cutting of the cake and for spectacular photographs to immortalize the moment. An enormous park, with more than two hundred species of trees and shrubs, which offer a perfect natural habitat to common wild animals of the Mantuan territory as well as some rare and protected birds such as the cuckoo, the red woodpecker and the hoopoe that often flit by chirping between the branches. This enchanting park, which is certainly the ideal location for an exciting and stunning outdoor reception, is divided into four main areas: the entrance, the dovecote, the ancient brolo, where two majestic mulberry centenarians stand out and where it hides a delightful secret garden that leads to the old warehouses, and the ancient aviary, with its rare examples of camellias, Japanese maples and English roses. The entire structure is for the exclusive use of the spouses for the entire wedding, from the civil ceremony to the reception. All in complete freedom of choice of catering and any other need, which will be guaranteed by the full cooperation of an attentive, discreet and professional staff. Villa Negri has successfully passed the 100 Quality Controls established by the "Certification Protocol of Historic Houses of Excellence" and is properly certified by the ITALIAN REGISTRY OF THE HISTORIC HOUSES OF EXCELLENCE. The phone number of Villa Negri is +39 0376968021.